This smoked gold dimmer switch is a real triple whammy. Firstly, it’s absolutely beautiful to look at, simple as that. Secondly, it’s incredibly useful, enabling you to control three different lights all from one switch. And thirdly, it’s really easy to use – the knurling on the edges of the knobs makes them really grippy, and a doddle to turn. Top marks all round. Smoked gold is one of those things you don’t realise you need until you see it, and then before you know it you’re well and truly hooked. Don’t worry, we’re all addicted to this stunning type of gold too! It must be the distressed finish with its swirls and whorls of golden browns, greys and pale greens that’s had a hypnotic effect on us all. Don’t fight it, feel it, folks. 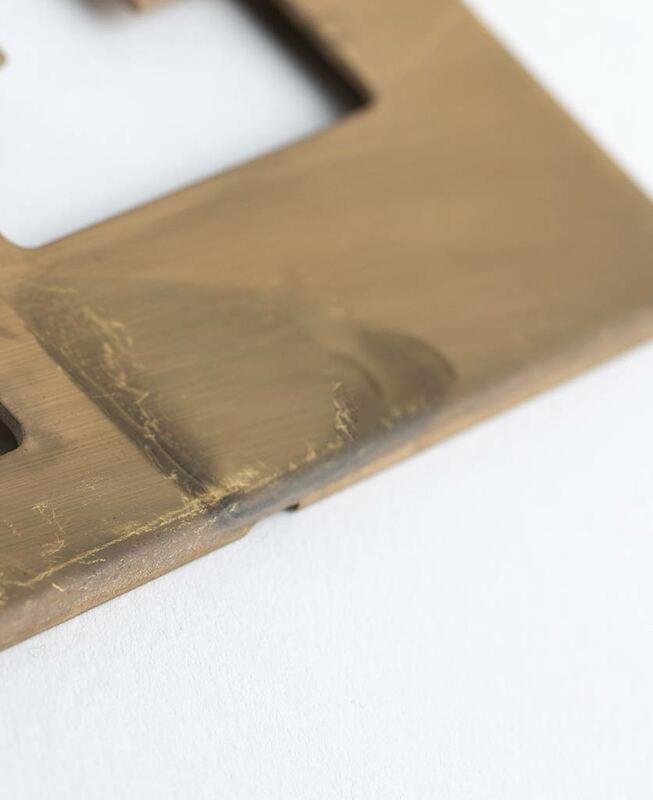 The ‘smoking’ process creates a unique finish, so every single one we make is one of a kind. So, if you’re a matchy-matchy type of person when it comes to interiors, then it might be time to embrace irregularity! 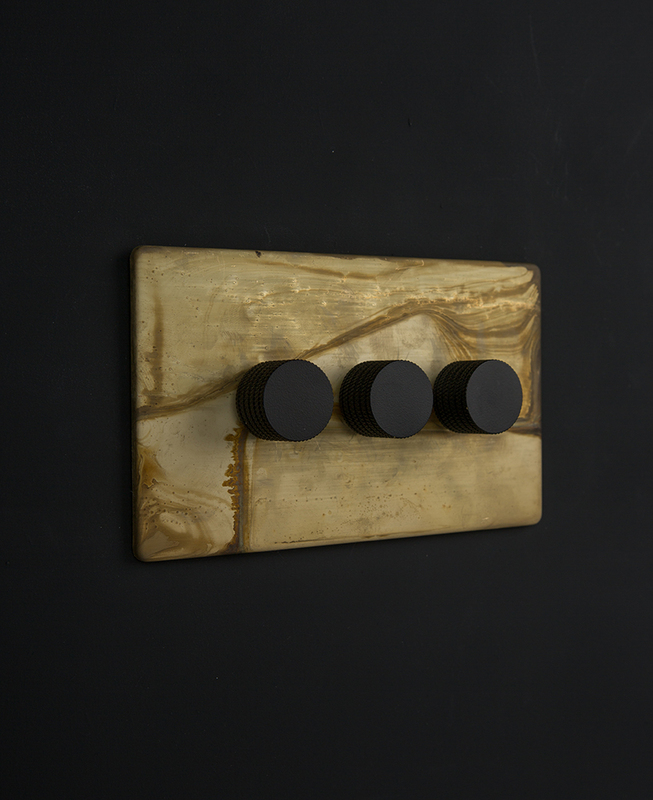 So, let’s talk knobs – one of our favourite subjects. We thought long and hard about what knobs to put on this switch, and we eventually plumped for these beautiful knurled ones. 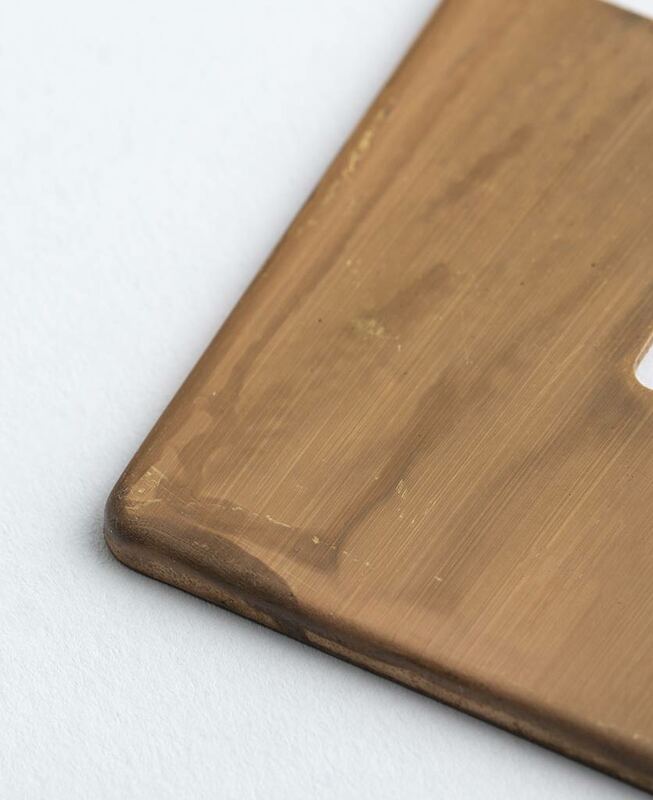 We think they’re the perfect partner for the smoked gold – the edgy design contrasting brilliantly with the smooth plate. We’ve given you four colours to choose from, all of which look amazing. But if we had to choose one? Hmmm, got to be the black. 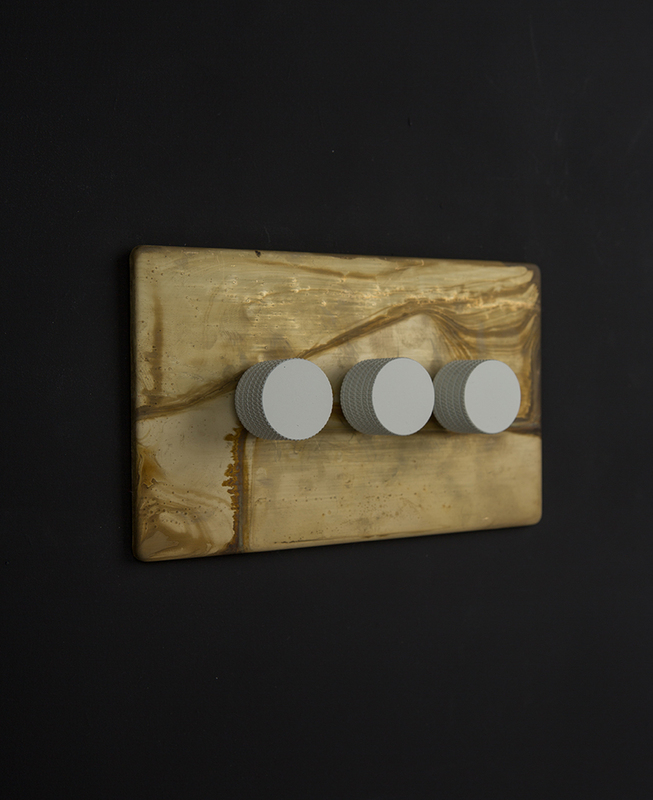 To tempt you further, this smoked gold triple dimmer switch is part of a collection of contemporary smoked gold switches and sockets. Our range includes single and double dimmer switches, toggles and matching plug sockets. These are exclusive to us so you’ll only find this range sold online by us. 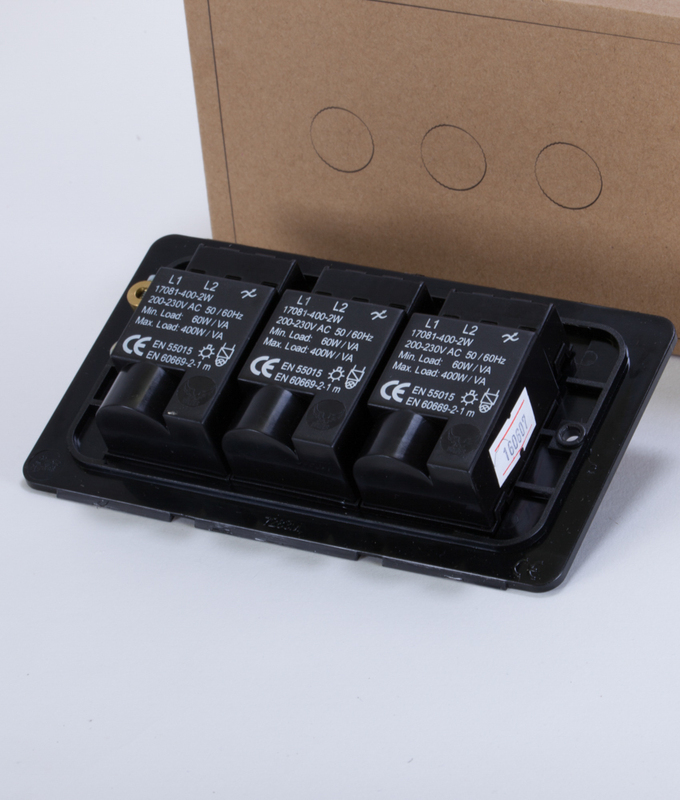 And if you need a helping hand figuring what type of switch does what, then check out our guide light switches explained to find out the difference between 1, 2 & 3 gang plus when to use 1 way, 2 way and intermediate switches.